Description of "It Happened One Pi Day"
Unlock the hidden power of your mind to memorize numbers. Memorize Pi to 100 digits... 300 digits... More? This story gives you the first 600 digits of pi. Train your mind for a lifetime of brain health, or even become a mental athlete. This book shows you the easy way to memorize pi, while at the same time giving you a PAO (Person Action Object) system that you can use to remember all of the numbers in your life. You will not only astound others by remembering hundreds of digits of pi... you will change the way that you see and remember numbers for the rest of your life. Yes. This book will let you quickly and easily memorize pi, but there is so much more. PAO is a method for memorizing numbers. This book uses a two-digit PAO, so there is a Person, an Action, and an Object for each number from 00 to 99. Learning pi becomes your training path. As you learn the digits of pi, you learn the vocabulary of the PAO which you will then use for all other numbers. You will be able to use this for all other number memory exercises. We take it to the next level. The PAO vocabulary that you will learn uses The Major System. The system works by associating each of the ten digits to certain consonant sounds. Think of it as a way of assigning a sound to each digit. Memory Palace is a technique used to memorize long sequences of numbers. Using this technique, you build a series of familiar places in your mind and then place the things that you want to remember into that context. This book combines a PAO system with a Memory Palace. This book makes it easy and fast. All that you need to do is read the story and remember the phrases. You will learn pi, and you will also give yourself a Major System PAO to apply to all other numbers. This is memory training for life. Eric and Jasmine and Adam live in New Hampshire in the United States. This was a family project. So far Jasmine holds the record for memorizing pi using this PAO. 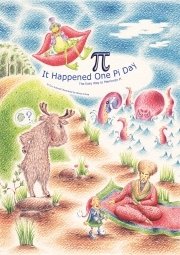 Reviews of "It Happened One Pi Day"